What better way to celebrate my birthday than with a feminist Victorian mystery? 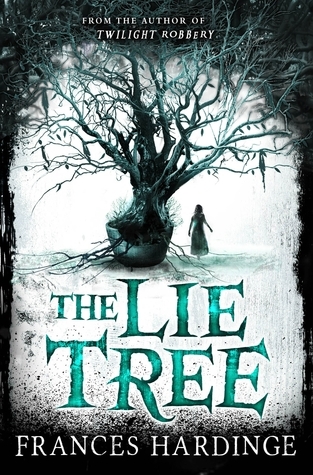 I checked out The Lie Tree based on its glowing review from The Book Smugglers. After a slow start, I was hooked and eager to know what would happen in this suspenseful novel. Faith's family moves to a remote island to avoid a scandal involving her father's scientific research. Since she has always idolized her father, Faith refuses to believe in the rumors. When he is murdered, she must find the answers, even if she doesn't like what she learns. I loved the statements that Frances Hardinge made about women in The Lie Tree. "There as a hunger in her, and girls were not supposed to be hungry. They were supposed to nibble sparingly at the table, and their minds were supposed to be satisfied with a slim diet, too. A few stale lessons from tired governesses, dull walks, unthinking pastimes. But it was not enough. All knowledge--any knowledge--called to Faith, and there was a delicious, poisonous pleasure in stealing it unseen." In a time where women were supposed to be invisible, the females in this novel seem to follow the rules. Under the surface, however, they are fascinating, passionate, full of motives, and fully formed. I plan to keep this in mind when I read about the famous men of this time period. What were the women really doing? This is a great book for eighth graders and older.